^ a b c d e f g “The century of the Brazilian Bombshell”. It's time for Brazil in Singapore (Singapore: Sun Media): 63. ^ Shari Roberts. “The Lady in the Tutti-Frutti Hat: Carmen Miranda, a Spectacle of Ethnicity,” Cinema Journal 32, no. 3 (1993): 6. ^ Eduardo Dussek. Carmen Miranda: Melodias Cifradas para Guitarra, Violão e Teclados. p. 41. http://books.google.com.br/books?id=towInTbvqnIC&pg=PA19&dq=carmen+miranda+casamento+david+sebastian. ^ Hollywood Songsters: Garland to O'Connor. 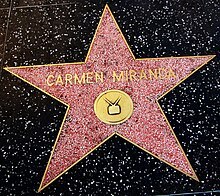 http://books.google.com.br/books?id=p3HWDtBhLykC&pg=PA608&dq=Carmen+Miranda+Jimmy+Durante. ^ Encyclopedia of World Biography | 2006; COPYRIGHT 2004 The Gale Group Inc.